Eaton Bray is a village and civil parish in Bedfordshire, England. It is part of a semi-rural area which extends into the parish of Edlesborough in Buckinghamshire and is about one mile from the Bedfordshire village of Totternhoe. 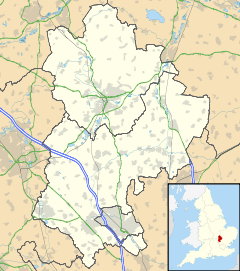 The toponym Eaton is common in England, being derived from the Old English eitone, meaning "farm by a river". The Domesday Book of 1086 lists it as Eitone. In 1205 the manor of Eaton was granted to William I de Cantilupe (d.1239), steward of King John (1199–1216). Eaton became the caput of the Cantilupe feudal barony known by modern historians as "Eaton Bray". The grant, for knight-service of one knight, was in exchange for the manor of Coxwell, Berkshire, which had been previously granted to him. Eaton had been held at the time of William the Conqueror by the latter's brother Odo, Bishop of Bayeux and Earl of Kent, but later escheated to the crown. At Eaton Cantilupe built a castle, the only remains of which is the moat at Park Farm, which is open to the public for fishing. The suffix "Bray" refers to Sir Reginald Bray (d. 1503) and the family that once held the manor in this village, which was at present-day Park Farm. In the Victorian era Arthur Macnamara (the "Mad Squire" of Billington) planned to build a mansion on the site of the castle, but ran out of money after completing the lodge at the entrance to Park Farm. Today the site of Wallace Nurseries is a housing estate and most of the roads take their name from this and some of the plant varieties they created, for example Saffron Rise and Coral Close. The parish church was built soon after 1205 for William I de Cantilupe using stone from nearby Totternhoe. The organ there was refurbished after a local fundraising campaign in the 1980s. The arcades of the nave and the font date from the Early English period. There is a 16th-century communion table. ^ "Civil Parish population 2011". Neighbourhood Statistics. Office for National Statistics. Retrieved 7 November 2016. ^ Charter Rolls, vol.1, p.147; Annales Monastici, vol.3, p.66, as quoted in Sanders, I.J. (1960). English Baronies, A Study of Their Origin and Descent 1086-1327. Oxford. p. 39. ^ Jones, Lawrence E. (1965). A Guide to Some Interesting Old English Churches. London: Historic Churches Preservation Trust. p. 9. Wikimedia Commons has media related to Eaton Bray.